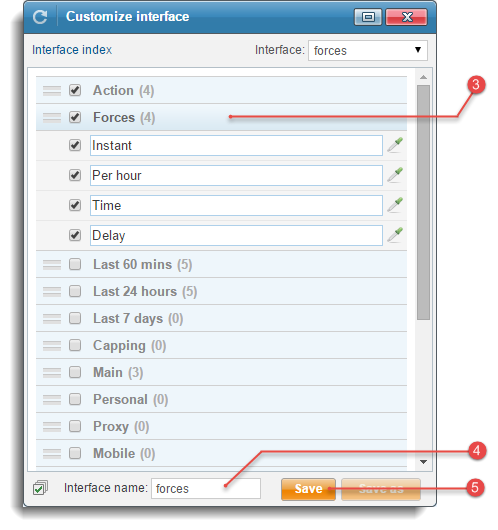 Interface is a customized selection of data columns displayed in the Stats table. TE3 “Interface manager” enables you to create various interfaces corresponding to your traffic trading actions, switch between them with just one click, or edit them at any time. 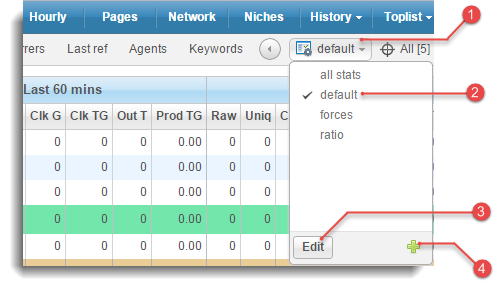 You can create and display interfaces in the following menus: Overview, Pages, Network and Settings / Sign-up page / Webmaster statistics. Click on the Interfaces button to open the “Interface manager drop-down”. Select the inteface you wish to survey, click on it and it will be loaded into the stats table. Selected interface is stored into a cookie. Next time you open this menu, last selected interface will be automatically displayed. We have pre-added a “Default” interface with stats for basic traffic trading actions. Although you can edit it, we advise you to create new interfaces and experiment with the settings you prefer. Click icon in the footer and open a “Customize interface” window. 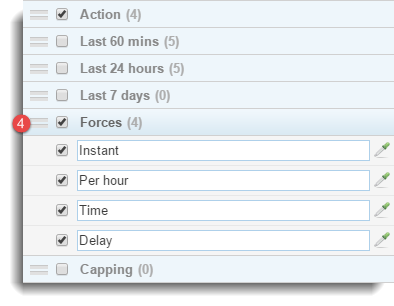 Available parameters are sorted into 12 expandable sections - enable a preferred parameter by check boxing it and it will be displayed as a column of data in the stats table (if you check box a section, you enable every parameter in the section). reposition all sections and parameters - simply drag them up and down and change column order. 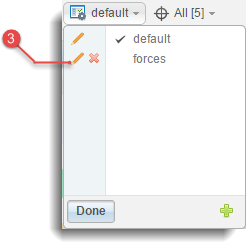 rename the enabled parameters - to view original column name, hold mouse over the input field and it will appear in the tooltip. 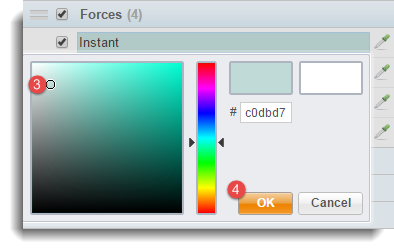 further customize your intefaces by setting a desired colour for each individual column. Navigate to the Overview menu, click on the Interfaces button and open the “Interface manager drop-down”. Click icon in the footer and open a “Customize interface” window. Select parameters you wish to enable. We'll enable Forces stats - you can Mass checkbox the whole section, or expand the accordion and Checkbox individual stats. Select a name for the new interface - we'll choose “forces”. Click or press Enter to save the interface. The new interface will automatically get loaded in the “stats table”. To switch back to “default” interface, open “Interface manager” and click on “default”. Click Edit button in the footer of “Interface manager”, then click Edit interface icon for the respective interface and open “Customize interface” window. To confirm your settings, click Save as. If you wish to save your modifications as a new interface, enter an Interface name and click Save. Click Edit button in the footer of “Interface manager“. Click Edit interface icon for the desired interface and open “Customize interface” window. We'll edit our “forces” interface. Let's rearrange column order - click on the Forces section header. Drag the section up and click or press Enter. Congratulations, you have edited the interface and repositioned “Forces” section. Use icon to open the “Color selector”. Let's set color for Instant column. Select the color from the palette. Then click anywhere in the large square to refine your selection. Click to set the color and the interface. Click button in the footer, then click Delete icon for the respective interface. 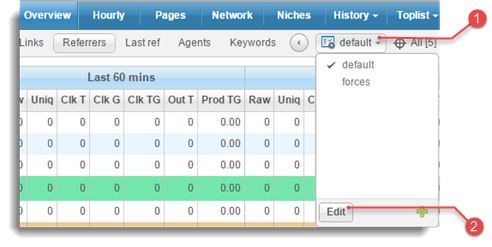 Network sync function allows you to copy interface to the other sites in your network. To proceed, select sites from the multiple select box and click Save button. If interface with the same name already exists on some sites in your network, it will be overwritten. 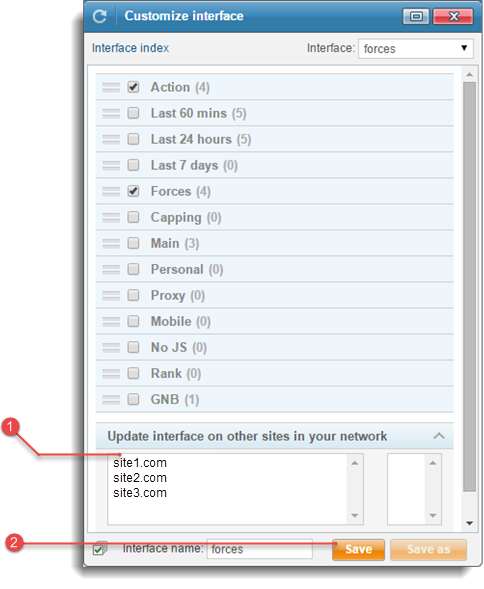 Select sites from the multiple select box (use CTRL + left mouse click to select / deselect preferred sites). Click button to perform the sync. The respective interface will be exported to the selected sites. If interface with the same name already exists on some sites in your network, it will be overwritten.